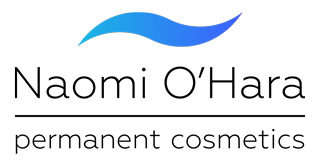 Over the years Naomi has treated both men and women who wish to remove or fade unwanted tattoos from all over the face and body. 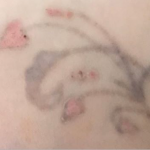 Naomi uses a number of techniques including laser tattoo removal and Rejuvi. It will be discussed in consultation which would be best for your tattoo and to achieve the results you want. Some people would just like to fade a tattoo for a cover up, others want the tattoo to be removed completely, which is possible for both. 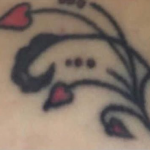 How does a laser remove a tattoo? A laser passes an intense light through the skin, which then penetrates to break up the ink particles and leads to the tattoo fading. Your body’s immune system will then remove these pigments, which work over time. 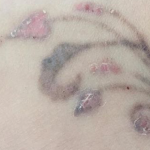 Newer technology and advances within lasers are reducing the side effects of tattoo removal. However, with that said, the risks haven’t been eliminated completely. The biggest danger is a risk of infection, however this risk can be reduced by following aftercare Naomi will give you following on from the procedure, these include keeping the area dry, clean and covered. 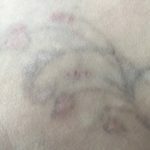 Will my skin be scarred after Laser Tattoo Removal? 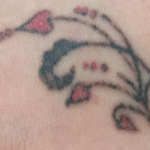 Again, by following aftercare and looking after your tattoo post laser removal the risks of scarring are minimal. The number of sessions is dependent entirely on the tattoo itself for instance the ink type, colours used, tattoo depth, tattoo age and skin colour of the client. It feels like a warm elastic band been twanged against the skin! So whilst not painless, the discomfort is probably no more than you experienced when you got the tattoo initially.